Yoga is an ancient spiritual practice that supports our desire for physical and mental health and spiritual harmony. Hatha yoga is the yoga that focuses more on physical well-being and help bring our bodies into balance using breathing, relaxation and body awareness using yoga asanas, or postures. More than a physical exercise, yoga encompasses mindfulness, concentration, mental awareness in a non-competitive environment. Anyone can do yoga at a pace that is appropriate for them. Our teachers have national certification through the Yoga Alliance at the top 500 hour level, which means we have had a minimum of 500 hours of formal training. We have both had far more than the 500 hours and have been teaching for many years. 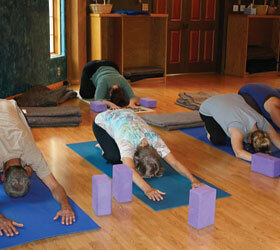 Debbie and Deborah both received their initial teacher training at Willow Street Yoga, which is an Anusara Yoga studio. Deborah also achieved Body Balance Yoga Therapy Certification with Jenny Otto. Both of us have also spent many hours in workshops with Rod Stryker in Para Yoga. We seek to guide your body into better alignment and health and facilitate your being able to say YES to life with your body, mind and spirit!